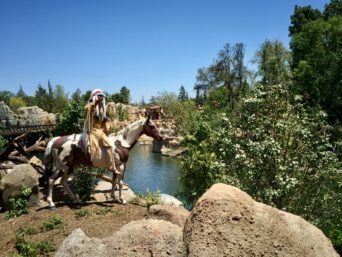 I’m working on a full photo tour of the newly reopened Rivers of America, but first, our experience with Disneyland’s new MaxPass system…. Disneyland just introduced a watered-down version of Walt Disney World’s MyMagic+, known as “MaxPass.” There are no wristbands and you don’t have to be staying at a Disney resort. Basically, it’s just a way to collect FastPasses via your phone instead of running all over the park like a maniac trying to collect them. Also, you get unlimited PhotoPass downloads, but that means nothing to me. Here’s a good introduction to the concept. The cost is $10/person per day, or $75/per person if you want to add it to your Disneyland Annual Pass. The latter has created an outcry among APs because only the top-tier Signature Plus Passports include MaxPass for free. The Signature Pass, which only differs from Plus in that the two weeks around Christmas are blocked out, requires you to pay extra for MaxPass even though that level of annual pass already includes free PhotoPass downloads. So right there you’re losing half of the benefit. We decided to try out MaxPass for 10 bucks before we committed to 75, and boy are we glad we did (not least because we later learned at City Hall that you can apply the $10 you spent on a day pass to the $75 price of adding it to your AP if you have your credit card receipt… supposedly. You know how it is at Disney: Ask a different cast member, get a different answer). When it works, MaxPass is GREAT! But when it doesn’t, it is SUPER frustrating. 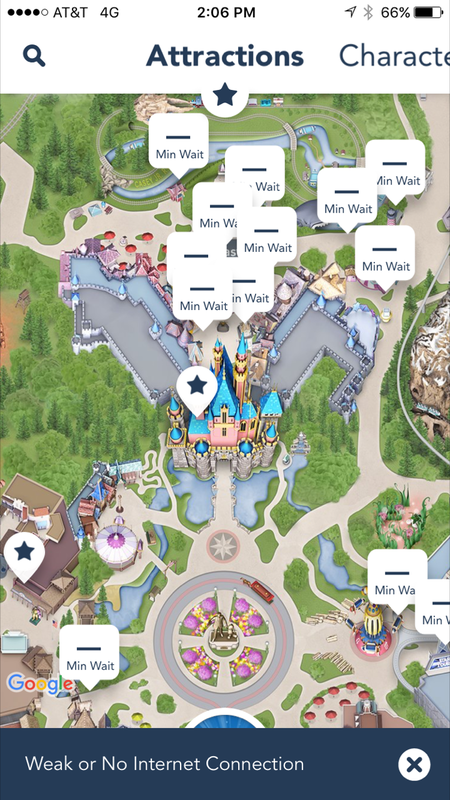 For the first four hours of our trip, the Disneyland app worked really well for me. I’d turned of WiFi to preserve my battery, and the app ran great on just cellular data. We were able to smoothly grab passes every time our availability window opened, so about every hour. 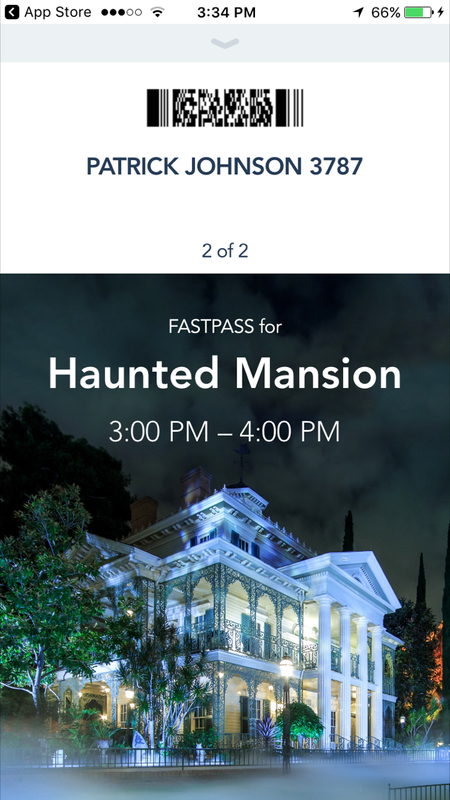 Unlike Walt Disney World, which allows you to book FastPasses months in advance, Disneyland won’t let you book MaxPass until you are physically inside the park. But what that means is, you can actually GET FastPasses to every ride, and within a reasonable time frame—sometimes as little as 15 minutes ahead. It isn’t like Walt Disney World, where Frozen Ever After FastPasses sell out 6 months in advance. This, we loved. However, after lunch I started to get the same “Weak or no Internet connection” errors from the Disneyland app that Patrick had been experiencing on his phone all morning. Even when my phone said I had full bars (dots? ), the app kept saying it couldn’t connect. Which meant not only could I not collect new FastPasses, I couldn’t even see what time my existing ones were for. 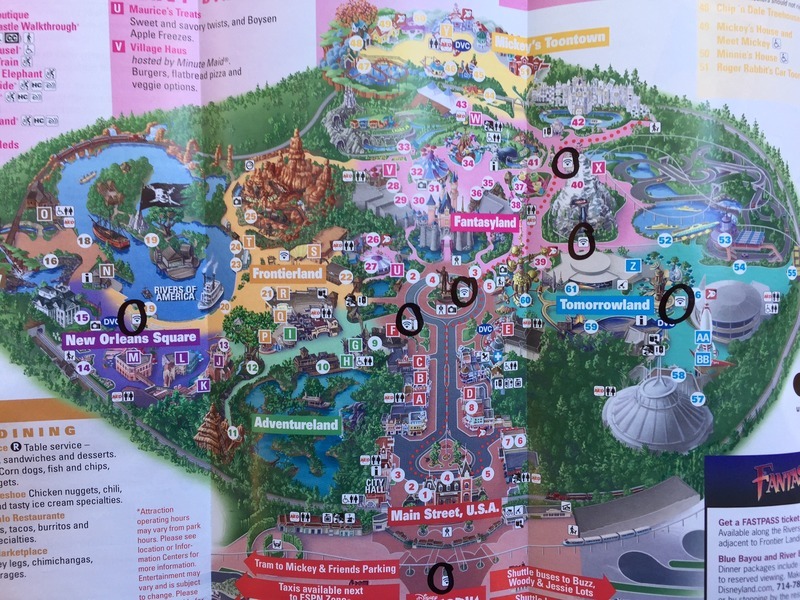 They do connect the passes to your AP, so if you can remember your time slot, you can go to the ride and scan your AP instead of your phone. But my top advice is take a screen shot of the FastPass for every member of your party, because chances are, you’re going to need them. You won’t even be able to see ride wait times if the app thinks you don’t have a connection. That meant that the only way to connect to the app was via WiFi. And Disneyland’s WiFi situation right now is a joke. Somehow Walt Disney World manages to blanket every one of those 43 square miles with WiFi, but Disneyland can only muster a handful of hot spots per park. You have to truck over to the east side of Disneyland or the plaza outside Carthay Circle Restaurant (but not inside the restaurant!) to get a signal and grab a FastPass. That’s right: There’s no WiFi in Adventureland, Frontierland, Fantasyland, Toontown or Critter Country! Complaining at City Hall will get you nowhere. They refuse to refund your money because the fine print say there’s no guarantee the service you’re paying for will actually work (or, more likely, because it’s a different business unit governing MaxPass). 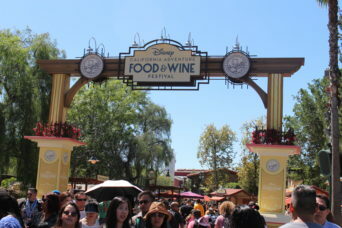 Every group before and after us in line was complaining about the same thing, and whenever we saw anyone else using the app in the park, they were also having problems connecting. So maybe hold off on MaxPass until Disney gets it sorted out. Supposedly they’re working on enhancing the WiFi coverage, but they won’t give a timeline. When it eventually does work, I think MaxPass will definitely be worth the 10 bucks! For now…. your mileage may vary. We were there the last week of July and first week of August 2017 (around the time of this post) and had no issue getting connected to get fastpasses on 7 different park days. We also have Verizon so maybe it was something to do with the carrier or a lot of AT&T users in the park at the same time? We had that issue at a college football game once. 100K people overloaded the AT&T bands, but my Verizon phone was working fine. AT&T ended up having to add temporary towers during game weekends. Whoa! I wish AT&T would add more permanent towers around Disneyland! Oh that’s interesting! 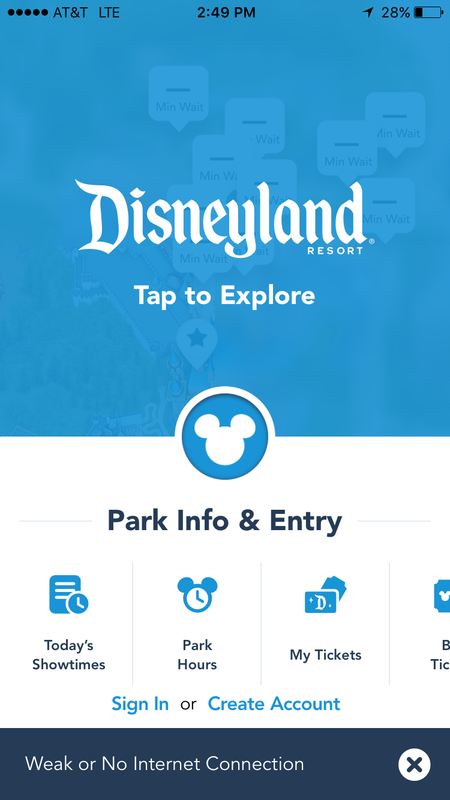 So there’s an app for Disneyland Paris, too! Does it really REQUIRE Wi-Fi to work? I used the app with my cellular data in the park and it worked just fine. Did that not work for you? Yeah, as I mentioned, it worked for me on cellular data flawlessly for the first four or so hours of our trip. (I’d turned off WiFi to save battery.) But once I started getting those bogus weak-signal error messages, the only way I could get it to work was to go stand directly under a WiFi hotspot. Ah, I see. So the problem was with the app itself, not the WiFi signal. Got it. Thanks for posting the review. Sure thing! Maybe I’ll go back and make that clearer in the post – thanks! One other thing, is it possible that, while you had full bars with LTE, that the cellular bandwidth was really congested so the Internet connection was super slow? Did you happen to do a speed test in the afternoon to see if your cellular speed was fast? I was in the park the week after D23 Expo and the T-Mobile network was so congested that everything was super slow and timing out, even though I had full bars and LTE. You know, I’ll bet that’s what was happening! I still don’t understand why Disney went live with this if their WiFi coverage isn’t complete and people can’t use the feature when cellular networks get congested.